mAh per display square in. 268mAh/sqrin. 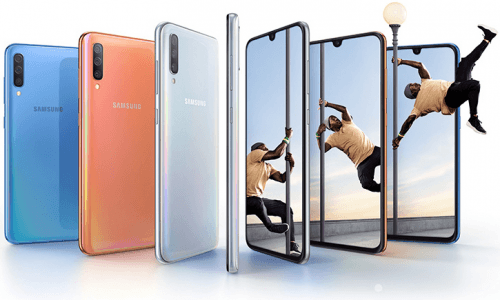 Also known as Samsung A70, the Galaxy A70 features an expansive 6.7-inch 20:9 Super AMOLED display with Samsung's Infinity-U design concept, while it rubs elbows with some of the best imaging-driven models of its time by touting a 32- plus 8- plus 5-megapixel triple-lens main camera. Besides, it also boasts one of the highest selfie cam resolutions (32 megapixels) as of its 2019 Q2 market entry. Also known as Samsung A70. Pros/Cons Review The Galaxy A70 blusters with a 32-megapixel selfie cam and a three-lens main camera, while running on a mildly-tuned 2GHz eight-core engine. Get to know the rest of its pros and cons in this specs-driven analysis. (more) Latest Samsung See all the recent Samsung phones. * We cannot guarantee that these specs are accurate. We urge you to do a confirmation of the key specs before making a final choice. Cell phone manufacturers sometimes omit certain functions, making it difficult for us to guess whether or not a specific cell phone has a specific function. If you see an error in this list of features, please let us know as soon as possible.